Composed of dense, high quality memory foam and designed with elevated and contoured side panels to provide luxurious support for your head and neck, while helping to prevent pain and stiffness in your neck and shoulders. 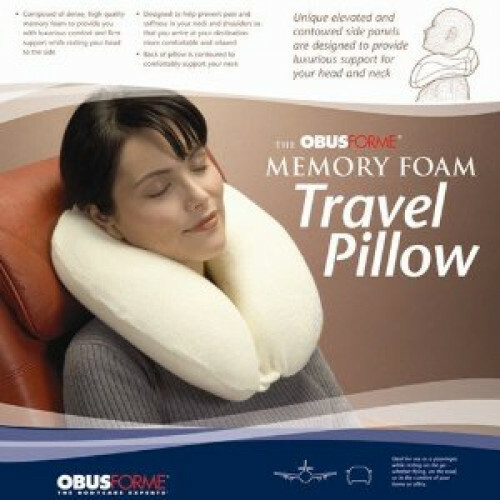 The contoured side panels of our Obus Forme Memory Foam Travel Pillow provide a comfortable option when resting your head to the side, while its contoured back panel provides comfortable neck support. A button clasp helps to prevent the pillow from slipping off your shoulders, and a pommel on the bottom of the pillow rests on your shoulders for additional stability. A flat edge on the back of the pillow rests against your seat without slipping.